This is Original 50 Cal. BMG Lake City M-8 Armor Piercing Incendiary (API) Linked 4 To 1 M-20 Armor Piercing Incendiary Tracer (APIT) Ammo. This ammo was manufactured by the Lake City Ammunition Manufacturing Facility for the U.S. Military. This ammo is brass cased, Boxer Primed, and 100% Non-Corrosive. 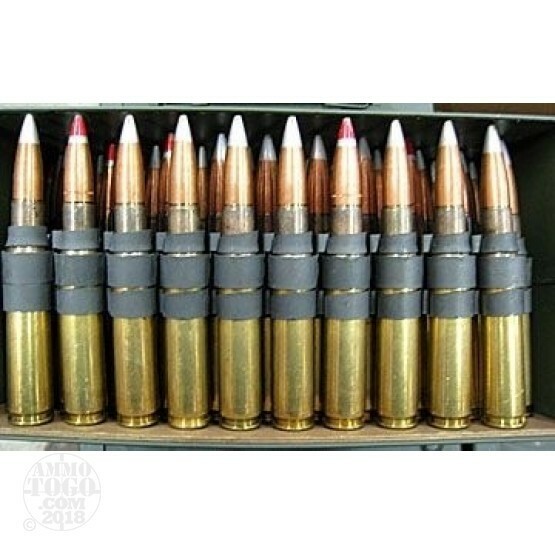 This is NOT pull down ammo that has been reassembled, it is original U.S. Military Lake City Ammo. We have a very small lot of this ammo and this was a one time deal, so when it is gone we cannot get anymore. This ammo is packed in a 50 cal ammo can.